Spring 2013 is sputtering in the starting blocks here in LA (lower Arkansas). Some jonquils have pushed through Mother Earth, while those expected in other well known locations are biding their time. The net result is a rat-tag looking landscape that borders on pitiful. Blame it on the yo-yo weather we’ve experienced in the last several weeks. Not every performance, not every picture, not every supper, and not every book knocks your socks off — and now unfortunately — we add “not every spring knocks your socks off” to the list. Fortunately we can rewind to April of 2009 and take a look at a really spectacular onslaught of buttercups as a substitute for a lackluster spring. Take a look at our 2009 buttercup post, “Buttercup Attack,” and judge for yourself. Also be sure and see the Photo of the Week page at Corndancer dot com for more buttercup banter. Click on the Lemurs for the original oCT. 2009 post. Seems like we were originally talking about a trip to the zoo when we flew off on the music tangent. It was indeed a good, if nto perfect day, to visit the zoo. Click here for the original post. We managed to shoot tigers, apes, antelopes, giraffes and more, not all of which we are showing. On the cute scale, there were Lemurs, always interesting. On the ferocious scale, we got a good shot of a Malaysian Tiger, a rare species. Along with the Tiger, we shot a tiny antelope, a “Kirk’s Dik dik,” who tops out at 15 pounds when fully mature. Seeing both ends of the critter spectrum gave me pause to think about how we look at critters and perhaps at ourselves. Click on the tiger for more story and pix. I expanded on those thoughts on the companion story to this epistle on the Photo of the Week page at Corndancer dot-com where you will see pictures of the tiger and the antelope. The story titled “It ain’t Tony.” takes a realistic look at the magnificent beast and her place in the balance of nature, which as of late, is teetering a tad too much. Click on the tractor to see our original post. I discovered in October 2011 that as small town festivals go, The Grand Prairie Rice Festival at Hazen, Arkansas is among the best and literally has something for everybody. It is top-notch family entertainment and without a doubt, is worth the trip. You can see everything from mechanical monsters to rescued raptors and a bunch in-between. I had the event on my hit-list after an invitation couple of years before I finally made the scene. See our original post for pix and details. It was worth the wait to see it all. I also scored four pounds of freshly stone-ground corn meal which my spousal unit handily converted into some fine cornbread. The single most unexpected and unusual attraction of the show was Randy Skarda’s restored 93-year-old Fairbanks-Morse power unit. The monster is as big as a house and will run on practically diesel, coal-oil, crude, or about any mixture of the above. See Randy and his magnificent machine on the Photo of the Week Page at Corndancer dot-com. Look for a link on that page to a gallery of picture of the big engine. Having stopped everything to watch the Superbowl yesterday, we are late and truncated this week. 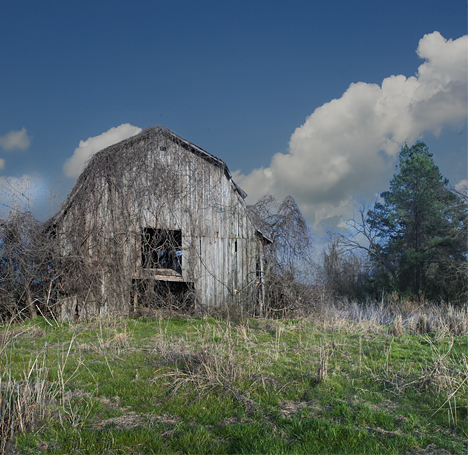 This old barn a mile or so north of the Arkansas River, north of my home town, Pine Bluff, Arkansas still stands, but with a slight list to port. It is in it’s winter mode so you can get a better look at details of building. Once the vines flesh out in warmer months, this view is gone. Click the pic to see the barn that’s gone. At our sister web site, Corndancer dot-com, this week we take a final look at a never-to-be-seen-again barn. It’s a goner. Flat as a pancake. 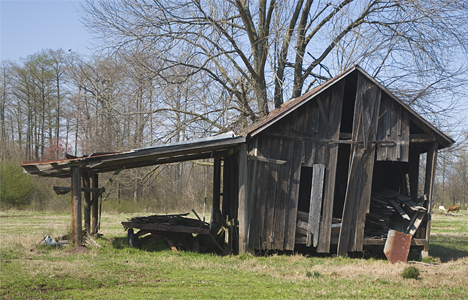 To present the other side of the picture, here at Weekly Grist, we give you a glimpse of two barns still standing. The old barn above was on a cotton farm, so you can be sure it held it’s share of mules and hay. I can’t vouch for the provenance of the aging structure but I’m guessing it first saw the light of day not much later than the early twentieth century at the latest. I’m guessing the structure is in the neighborhood 35 feet tall, give or take a standard deviation or two. It stands tall today. Down south of town, you’ll find another old structure, not nearly as big, nor as old. Nevertheless, it has the well seasoned grayish cast that barn lovers treasure, so we’ll just call it an old barn regardless of its former purpose in life. This barn, pales in size to the one above, but still passes muster in old barn coolness. 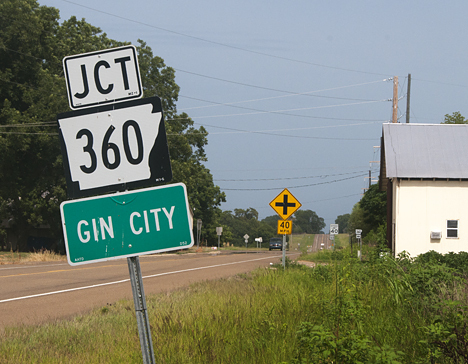 In a former life, I would have probably stopped in this hamlet to determine the accuracy of its moniker. Those of you who know me best understand perfectly.